When I started blogging, I had no idea what I could possibly write about. I racked my brain, trying to think of a topic that would keep me (and my readers) endlessly interested. The only thing I could think of writing was a travel blog. After all, travel consumes me. So travel it was! I quickly realized that writing about travel was dead boring. My blog was me, me, me, all the time. Furthermore, who would possibly trust me, a rogue blogger, over an official travel source such as Lonely Planet or Let’s Go? I don’t even trust me! It literally took me only 3 advice posts to run out of fuel for what I was doing. My motivation dragged as I googled “travel blogs” or “women work abroad”, only to return thousands of blogs just like mine- or even better than mine. I wasn’t being original. It wasn’t me. I started looking outward for inspiration to turn my blog around. I find, time and time again, when you set a positive intention, the universe conspires to help you. I fully credit this idea to Paulo Coelho, author of my favorite book, The Alchemist. Anyway, I was sitting in Saturday class, internally whining about my exhaustion after a long week of work and school. And then, BAM! Inspiration smacked me right in the face (figuratively). In this case, “inspiration” was one Kristin Stith. I’ve officially joined the Kristin Stith fan club. 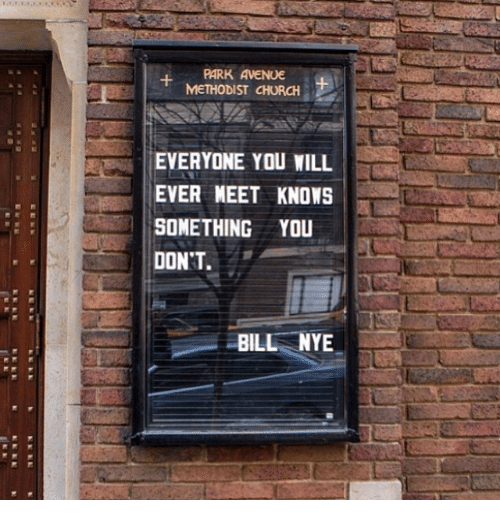 In the words of Bill Nye “Everyone you will ever meet knows something you don’t.” This quote reminds me that I already know everything there is to possibly know about myself. This argument counters my mom, who says “I know you better than you know yourself.” Well, Mom, that’s just not true. I am the only person who’s literally been with myself for every second of every day. I know 100% of what I could possibly say, think and feel. I’m boring! Note: This is a test to see if Mom actually reads my blog like she says she does. Notice anything different about this post Mom? Hmmmmm? Anyway, Mom tangent over. The true theme of this blog post is how important it is to support the passions of others. Blogging forced me to seek out what’s most riveting, excellent, and important about people who are different from me. When I started meeting with people around the community, I received the best blog content when I focused on learning from whoever I interviewed. I transformed my rationale from “self-focused” to “other-focused”, in the words of Robert E Quinn. Think about it- if I just talk about myself during a blog interview, what would I learn from the other person? It would be virtually impossible to find valuable content to blog about. I suppose that now I’ll take you off the edge of your seat about the question Kristin kept asking me while we had coffee. When Kristin and I talked, I told her about one of my projects (work, school, and so on), and she’d ask me “Are you learning?” each time. Even though it was the same question, it was repeatedly difficult to answer. I realized I was swimming through the motions. I wasn’t listening. I wasn’t learning. Blogging inspired me to pay attention to other people’s passions. From interviewing others 2-3 times a week, looking for purpose within individuals became a habit. This habit spilled over into my daily interactions. For example, last week I had an awesome conversation with my cashier, David, at Trader Joe’s. I asked him if he’s been working on any interesting projects lately, and he told me about his dream to be a motivational speaker. David is currently working on a motivational YouTube series to support his vision. Now, Old Lexi (self-focused) would’ve responded “oh cool”, rationalized that statistically the odds are against him, and moved on with my life. But New Lexi (other-focused) was excited about someone else’s passion. New Lexi found out what inspires David’s passion and the audience he hopes to reach. New Lexi asked David to write down the name of his YouTube series (WithinRSelf) on the back of the receipt, and then actually watched his video. We can support the passion of others in so many ways. Let’s start simple. Aren’t we tired of groaning “How was your day” and hearing someone mumble back “gooooood”? What if, instead we asked “What’s an interesting project that you’re into right now?” By making our conversations others-focused, we learn. Remember, you already know 100% of whatever there is to know about yourself. Supporting other people’s passions is so exciting! The quality of my conversations has drastically increased. Now, every time I go back to Trader Joe’s, I’m stoked to find my new friend David and talk to him about latest developments with his dream. We can go beyond cutting out small talk. If your buddy is in a band, check out their gig. If someone invites you to their poetry reading, go. Are you seeing the re-occuring theme here? GO! When someone’s passion is “out there” or will obviously be difficult to achieve, all the more reason to support them. RSVP to their art show, read the draft of the first chapter for their new book, check out their YouTube video, buy a ticket to their Roller Derby game, go to the event they’re putting on for work. Send them anything you see that reminds me of their passion, be it a well-executed advice column or art related to their passion. Watch your connection grow, not only with the other person, but within your community. Supporting others is the best way to refine the direction that we seek in our own lives. Now, I’m not saying I’m perfect at being others-focused. Literally this entire blog post is me talking about myself. But I am working on it. My challenge to you today is to join me in supporting passions we find around us. Catch yourself the next time you ask someone “How are you” and change it to “What are you excited about this week?” Check out The 36 Questions that Lead to Love for even more ideas on what to ask others about. I challenge you to active listen about someone else’s passion for 5 minutes today. Then, try again tomorrow. And the next day. Listen, really listen, to the guy at the post office, Trader Joe’s, your waiter, or your life partner. In the words of Kristin, ask yourself: Am I learning? By supporting other’s passions, in return, we inherently feel inspired. Our eyes open to all of the passion and purpose in action around us that we never noticed before. As always, let me know how your 5 minutes of active listening goes by leaving a reply below!